Wakeboard Center Cable Krk in Punat bay on island Krk, Croatia, hosted from 3 to 8 June international *** IWWF ranked event for Junior and Open categories, including the most important – Seated category for disabled riders. The event started on 3 June with wakeboard school and training program for disabled riders, followed by the competition on Friday and Saturday, 7-8 June. Beautiful weather and perfect riding conditions accompanied by cool music and side events resulted in a memorable weekend packed with action. 40 riders from Croatia, Slovenia, Austria, Italy, France, Hungary and Netherlands took part. The winner in Seated category is Emanuele Pagnini of Italy who thrilled both judges and spectators with spectacular performance, followed by Philippe Turchet from France on the second position and Zdravko Lakic on the third place who made all Croatians particularly proud. Winners by categories are: in Wakeboard Robert Pokovec from Slovenia in Open Men, Naja Puhan, also Slovenian, in Open Ladies, Timo Kapl from Austria in Junior Men, Rudolf Vinko Dekovic from Croatia in Boys. Wakeskate winners are Matic Flajs from Slovenia in Open Men and Sanda Jelicic from Croatia in Open Ladies. All riders won points for IWWF Cable Wakeboard World ranking list and the prize money of 2.500 EUR provided by Luminox watches, Memento Venerem shop from Krk and Wakeboard center Cable Krk. We kindly thank the event sponsors Luminox Croatia, Memento Venerem shop, Optima telekom, Hypo Alpe Adria Bank, Heineken, O’Neill Croatia and Hoteli Punat. Dj Preddyof Austria kept the crowd entertained with hip hop, funk & reggae selection,and German writers Mr. Woodland i D.Vice of Deadly Habits created a super cool 30×2,5m graffiti. Event organizers are Croatian Waterski and Wakeboard Federation, Wakeboard club Krk and Balance from Rijeka. The aim of this sunny project was integration of all disabled and able-bodied riders and fans of wakeboarding into a unique weekend of sport and fun. Are you ready to rock’n roll? On 3-8 June Wakeboard Cable Krk will host Luminox Krk Handi Wake – an international IWWF ranked ***wakeboard and wakeskate competition for Juniors and Open, including the Seated category for disabled riders! A traditional Krk Handi Tricks – wakeboard school and competition for disabled, hosted every June since 2004, this year for the first time welcomes all wakeboarders and wakeskaters to take part. The event starts on Monday, 3 June, with all-week trainings for disabled riders. Official training and the qualifying rounds will be on Friday, 7 June in the afternoon, and the finals in all categories on Saturday, 8 June 2013. For all competition related information and invitation please visit the competition page at cablewakeboard.net. Our official opening date 2013 will be Friday, 26 April. Although we initially meant to open on Easter weekend and work weekends in April, bad weather troughout the winter prevented us from completing maintenance on time. Wakeboard center Cable Krk will on Saturday, 22 September host Luminox Wakeboard Croatian & Slovenian Nationals. The event starts on 10 a.m. with qualification rounds. Finals are scheduled for 2 p.m. and we expect around thirty best Croatian and Slovenian riders to take part. The winners will get nice prizes and presents from the sponsors: Luminox watches, Optima telekom, Memento Venerem shop and O’Neill Croatia. Our speaker Marko Petar Oreskovic and DJ Jericho of Balance Crew will make sure all guests have a good time, with goos selection of hip-hop, r’n'b, funk & reggae. We kindly invite you to join the event on Saturday and support the riders! For more info please visit wakeboarder.hr and like us at facebook.com/cablekrk. Mednarodna wakeboard šola in tekmovanje za invalidne osebe. Športno rekreacijski center Cable Krk (Hrvaška) je od 11-16 Junija gostil Krk Handi Triks; deveto tradicionalno šolo in tekmovanje za invalidne osebe. Sodelovale so osebe iz Hrvaške, Slovenije, Italije in Francije , ki so se razlikovale po nivoju znanja- od popolnih začetnikov pa vse do visokega nivoja znanja. Program je bil zaključen na vroč in sončen sobotni dan, v čudovitem vzdušju in z odličnim nastopom na vodi. Dan se je začel z kvalifikacijami hrvaških tekmovalcev za nastop na Cable Wakeboard Evropskem prvenstvu septembra v Toulousu v Franciji.V treh kategorijah so se kvalificirali štirje tekmovalci: Mara Parentic in Paula Babic v kategoriji Girls, Rudolf Dekovic v Boys in Nikola Vranesic v Open Men. Sedem tekmovalcev je sodelovalo v kvalifikacijah za Krk Handi tricks ob 11 uri zjutraj, finale pa je sledilo ob 15h popoldne. Proga je omogočala tako vodne trike, kot tudi trike na objektih v dolžini 300 m. vožnje tekmovalcev so ocenjevali trije sodniki. Rezultati so bili pomnoženi s koeficientom stopnje invalidnosti. Zmagovalec dneva je bil Philippe Turchet iz Francije, dolgoletni tekmovalec in predsedniki oddelka kategorije za invalidne osebe mednarodne waterski in wakeboard federacije.Emanuele Pagnini iz Italije je zasedel drugo mesto, le za 0,4 točke pred Zdravkom Lakicem iz Hrvaške, ki je bil tretji. Marko Petar Oreskovic je bil odličen moderator, ki je obdržal nasmeške vseh skozi cel dan in DJ Preddy iz Avstrije je obdržal razpoloženje po podelitvi nagrad in skozi cel večer na after partyju v Piccolo baru v Punatu z selekcijo funk, reggae in chill out hip hop glasbe. Glavni sponzorji prireditve so bili: mesto Krk, turistično združenje mesta Krk, Hotel Park Punat, Heineken, Optima telekom & company Svijet mora. Udeležba je bila brezplačna za vse in vsi udeleženci so prejeli nagrade sponzorjev. Krk Handi Tricks je tradicionalna prireditev že od leta 2004 v športno rekreativnem centru Cable Krk. Cilj tekmovanja in šole je predstavitev športa širši javnosti kot odlična rekreacija tudi za invalidne osebe. Krk Handi Tricks je teden poln zabave, poučnih lekcij ne samo za naše invalidne kolege, ampak tudi za nas, ki jemljemo življenje za samoumevno. za več informacij o vodnih športih, waterskiing in wakeboarding na Hrvaškem obiščite naso spletno stran: www.wakeboarder.hr. 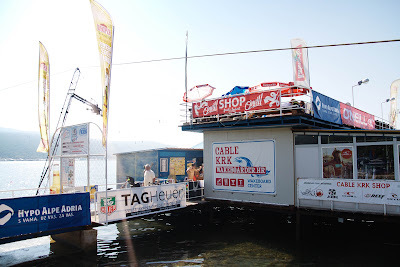 From Monday 11 June till Saturday 16 June 2012 Wakeboard Center Cable Krk will once again host Krk Handi Tricks – Wakeboarding school and competition for disabled. The training involves competitors from European countries, mainly paraplegic athletes, who practice wakeboarding sitting on a specially adapted wakeboard. Newcomers train together with the advanced riders and during this week instructors are available to all every day from 10 till 21 hours. The official hotel of the event is Hotel Park in Punat. Please mind the deadlines for booking as the number of wheelchair accessible rooms is limited. Participation in sports part of the program is free of charge for all athletes. Anyone interested to join can contact us at contact@wakeboarder.hr or +385 91 26273 02. Support also came from the local community and the International Waterski & Wakeboard Federation whose president of the Disabled Council, Philippe Turchet from France, participates every year as an instructor and competitor.This unique and traditional event is held every year beginning June since 2004 and it has been identified as a one that raises the quality of life for disabled and hence supported by main sponsors – City Krk and company “Svijet mora” that runs Wakeboard Center Cable Krk. Krk Handi week will be concluded on Saturday, 16 June 2012, with a wakeboard competition, starting at 11 am. Competition is held in freeride format by IWWF CWWC rules. For more information about waterskiing and wakeboarding in Krk, Croatia, please visit www.wakeboarder.hr. Wakeboard Cable Krk bo odprl svoja vrata v petek 6. aprila 2012. do konca aprila bomo delali samo med vikendi. Od 27. aprila – 30. septembra pa bodo naša vrata odprta vsak dan v tednu.